Online freelance platform Upwork (UPWK) will IPO on Wednesday, October 3. At a price range of $12-$14 per share, the company plans to raise up to $90 million with an expected market cap of ~$1.3 billion. At the midpoint of the IPO price range, UPWK currently earns our Unattractive rating. UPWK is unprofitable (like a record 83% of IPOs so far this year), but there’s more reason to be optimistic about this IPO than many others we’ve looked at in the past. The company’s accelerating revenue growth and improving capital efficiency provide some reason to believe it could potentially justify its valuation (or at least prove appealing to a potential acquirer). 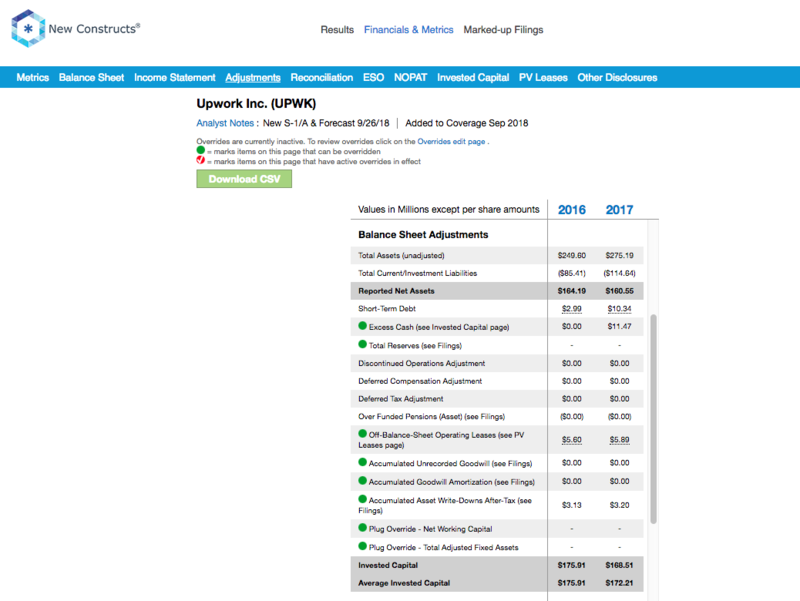 This report aims to help investors sort through Upwork’s financial filings to understand the fundamentals and valuation of this IPO. UPWK was formed through the merger of competing companies Elance and oDesk. It earns revenues by charging service fees to freelancers that find work on its platform. These fees are based on a percentage of a freelancer’s billings with each client. The company has 375 thousand freelancers on its platform performing work for 475 thousand clients. The company earned $122 million in revenue from these users through the first six months of 2018, up 14% year over year. While we don’t have models for UPWK’s direct competitors – such as Fiverr or Freelancer.com – the company’s role in connecting buyers and sellers of labor makes it similar to eBay (EBAY), which connects buyers and sellers of used goods. eBay, with a return on invested capital (ROIC) of 21% and over $10 billion in revenue over the trailing twelve months, represents a best-case scenario for UPWK’s future profitability. Figure 1 compares UPWK to EBAY on the basis of average invested capital turns (revenue/average invested capital) and a number of trailing twelve months profitability metrics. It shows that UPWK already matches or surpasses EBAY on capital efficiency and fee percentage, but still lags far beyond on overall profitability. UPWK investors must believe that, as it grows, economies of scale can improve its profitability. In particular, the company may at some point become large enough where it becomes economical to build their own server farms rather than use Amazon Web Services (AMZN), which could significantly improve gross margin. On the other hand, UPWK may not be able to sustain the 12.9% of Gross Services Volume that it collects in fees. The company’s fee percentage is smaller for clients that spend larger amounts on a single freelancer, so as UPWK tries to attract larger enterprise clients it may see its fee percentage decrease. Accelerating Growth: UPWK’s year-over-year revenue growth improved from 23% in 2017 to 28% through the first six months of 2018, and its core client growth improved from 13% to 22%. Client Spend Retention: Not only is UPWK attracting new clients, it’s generating more value from existing clients. Through the first six months of 2018, its client spend retention rate was 106%, which meant existing clients spent 6% more than they did in the first six months of 2017. Positive Free Cash Flow: We don’t have enough data to calculate free cash flow on a TTM basis, but in 2017 UPWK earned $5 million in free cash flow. This positive free cash flow, combined with a fairly small debt burden, means investors shouldn’t need to worry about liquidity. No Dual-Class Shares: Unlike many other recent IPO’s, UPWK doesn’t have a dual-class share structure. Public investors get the say in corporate governance they deserve. Expenses Growing Faster than Revenue: If UPWK wants to grow into profitability, it needs to rein in its expense growth. Through the first six months of 2018, revenue grew 28% year-over-year, but cost of revenue grew 29%, general and administrative costs grew 36%, and sales and marketing grew 52%. Significant Competition: UPWK faces competition to become the dominant platform for hiring freelancers. Notable competitors include fellow startup Fiverr – which gets superior reviews compared to UPWK from freelancers – and Microsoft’s (MSFT) LinkedIn ProFinder. Small Market: As we’ve argued before, the gig economy is overhyped. A recent survey from the Bureau of Labor Statistics showed that just 1% of U.S. workers work through online platforms, and of those ~20% are in transportation (i.e. Uber and Lyft drivers). The number of online freelancers is simply not that large. Our dynamic DCF model shows that the future cash flow expectations baked into UPWK’s valuation are optimistic, but not impossible. To justify the midpoint of its IPO range at $13/share, UPWK must immediately achieve 8% NOPAT margins – halfway between its current margin and EBAY’s – and grow revenue by 21% compounded annually for 12 years. See the math behind this dynamic DCF scenario. To achieve that level of sustained revenue growth, UPWK would likely need to obtain a dominant share of the online freelancer market. If competition slows its growth even slightly, the stock has significant downside. If UPWK earns the same margins as the scenario above but only grows revenue by 15% compounded annually for 10 years, the stock is worth just $5/share today, a 58% downside. See the math behind this dynamic DCF scenario. Additionally, UPWK could be an acquisition target down the road. Potential acquirers could include Microsoft, should LinkedIn ProFinder fail to gain traction, Fiverr, if it wants to consolidate through acquisitions, or traditional staffing agencies that want to jumpstart their entry into the freelance market. Income Statement: we made $2 million of adjustments, with a net effect of removing $2 million in non-operating expense (1% of revenue). 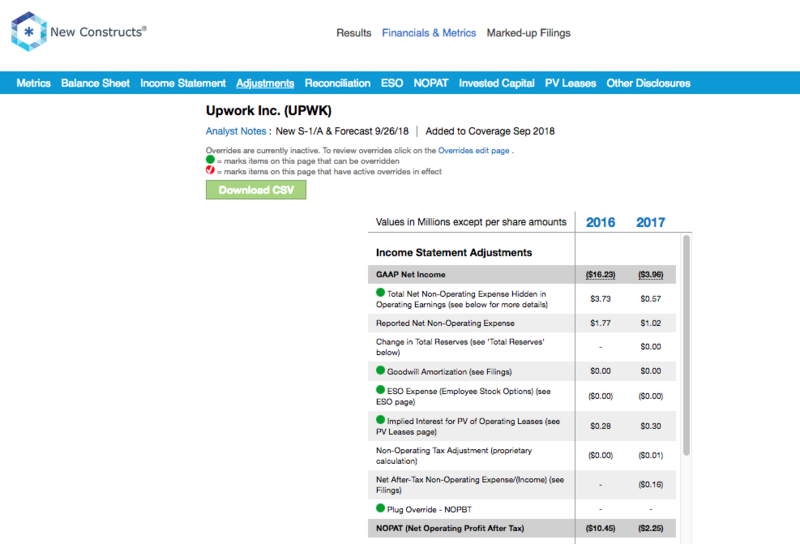 You can see all the adjustments made to UPWK’s income statement here. Balance Sheet: we made $31 million of adjustments to calculate invested capital with a net increase of $8 million. The most notable adjustment was $6 million in off-balance sheet debt. This adjustment represented 4% of reported net assets. 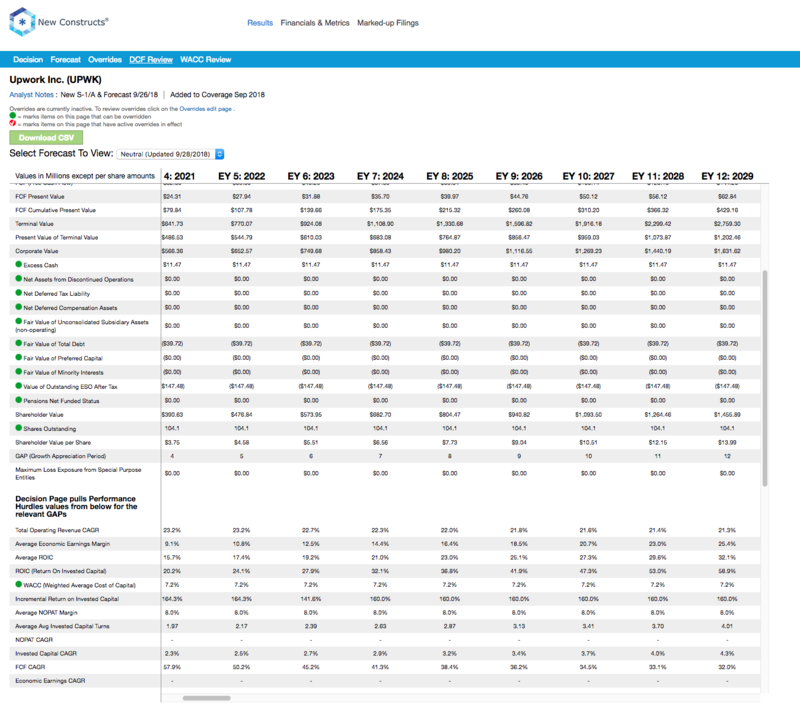 You can see all the adjustments made to UPWK’s balance sheet here. Valuation: we made $199 million of adjustments with a net effect of decreasing shareholder value by $175 million. The largest adjustment to shareholder value was $147 million in outstanding employee stock options. This option adjustment represents 11% of UPWK’s proposed market cap. This article originally published on October 2, 2018. 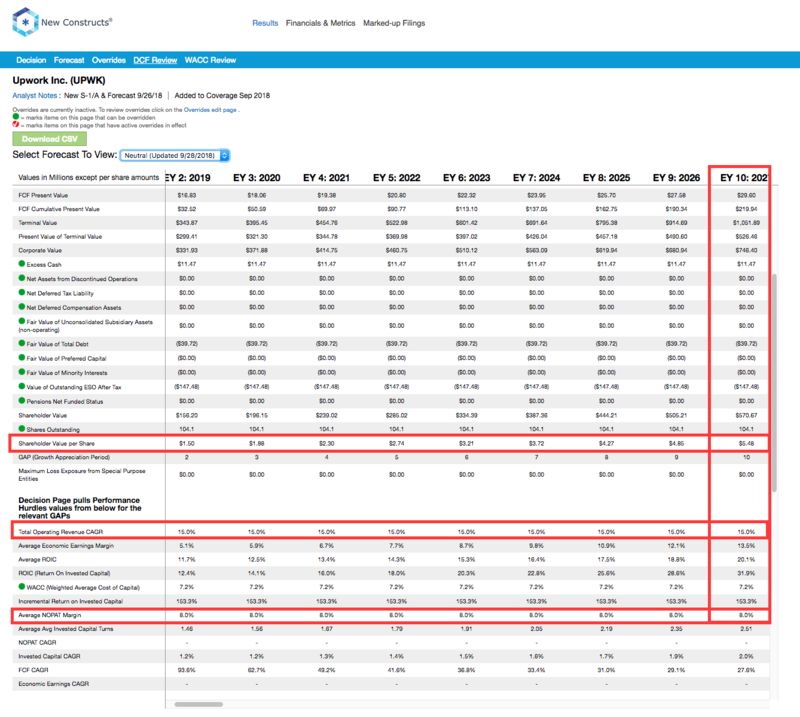 IC Turns, NOPAT Margin, and ROIC are estimated numbers due to incomplete data that does not allow us to build a full TTM model.